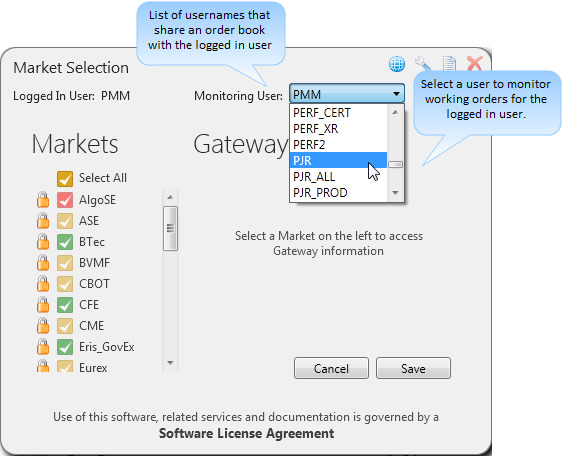 The Gateway Login dialog shows the logged in username and contains a Monitoring User: selection list box, which shows all usernames in the shared member group of the logged in user. The Monitoring Username (e.g., Tag 50 on CME) can be changed to any user in your shared order book through the Monitoring User selection list box. Select Login Gateway from the Settings menu. The Markets Selection dialog appears. Click the arrow in the Monitoring User: drop down list and select a username. Select your working orders in the Order Pane of the Orders and Fills Window, Order Book, or Parent Order Book and click Update User in the Order Toolbar. The Monitoring Username column in the Order Pane is changed to the username selected in the Login Gateway Dialog. For subsequent orders, the Monitoring Username displays this selected username. The Operator ID is also changed and sent to the exchange to identify the monitoring user.